IEMTA are delighted to welcome you to our Spring Scientific Meeting on Saturday 27th April. The programme for the day is not available. Coming this Spring, we have the highly anticipated Spring Scientific Meeting. In times past, this event took place on a Friday evening. 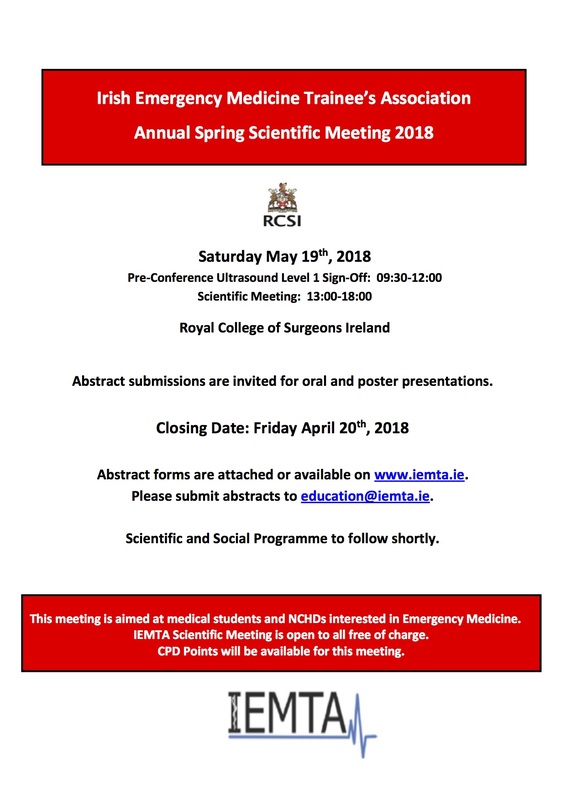 Given the growing interest in EM and growth of our members, we’d like to try something different this year – the meeting will take place over a full day, on Saturday May 19th, 2018 with an Ultrasound Level 1 Sign-off component preceding the Scientific Meeting. Scientific Programme and Social Programme will follow in coming weeks! We are formally accepting abstracts for oral and poster presentations. Closing date is April 20th, 2018. Abstract submission forms and meeting poster are attached below. Abstracts can be emailed to education@iemta.ie. Instructions on Ultrasound sign-off are attached below. Please email education@iemta.ie if you’d like to attend the pre-conference (pending sign-off requirements). IEMTA are delighted to a nnounce that we are hosing an All Ireland Training Day on Friday 24th November 2017. The day is targeted at junior trainees in EM but open to all. The programme will cover Sports Medicine in the morning and resuscitative ultrasound in the afternoon. Full details here in the programme. Thanks to Andy Neill & Ian Kennedy for organising the event. 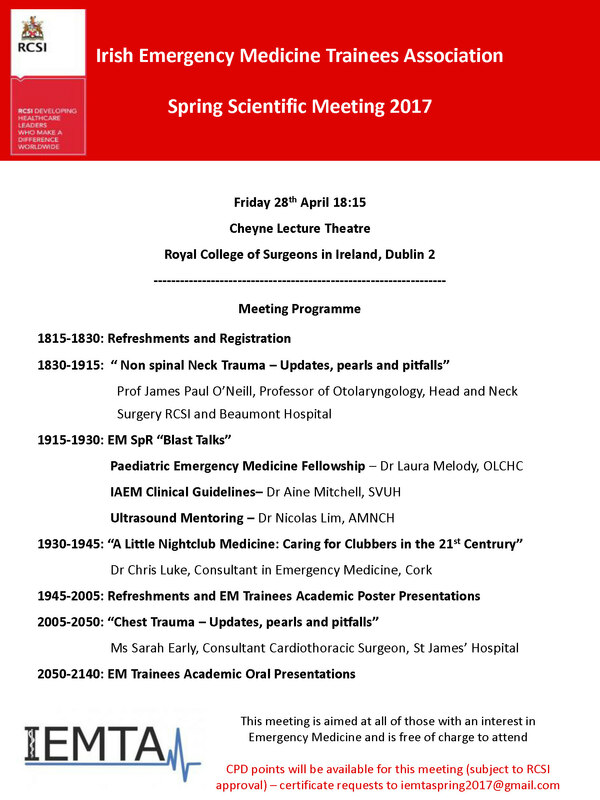 IEMTA are delighted to announce our upcoming Spring Scientific Meeting in the Royal College of Surgeons in Ireland on Friday 28th April 2017. To help us improve for next year, we’d be grateful of your feedback. Please click here to complete our quick feedback form. 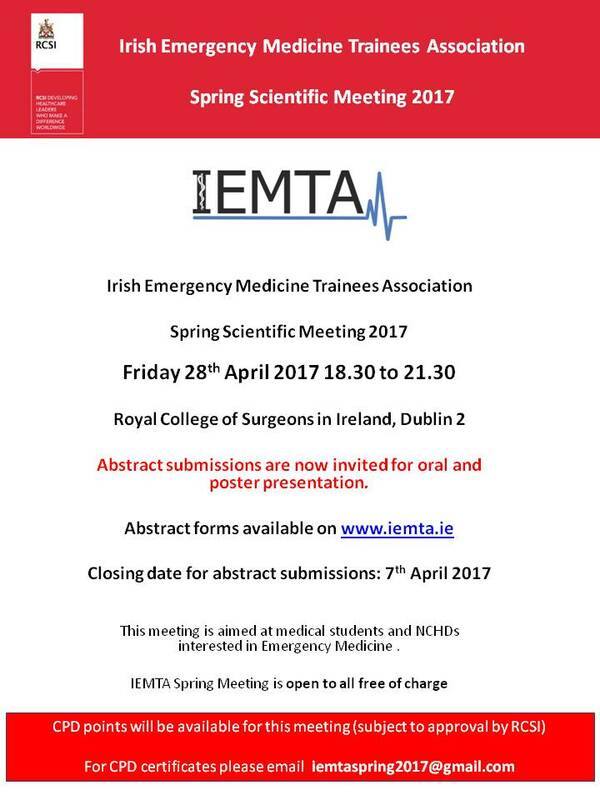 IEMTA are delighted to announce their upcoming Spring Scientific Meeting in the Royal College of Surgeons in Ireland on Friday 28th April 2017. Finalised details of guest speakers will follow very soon! This is a fantastic opportunity for NCHDs and medical students interested in Emergency Medicine to presnt their case reports, audits and research at a national meeting. Abstract submissions are invited for oral and poster presentations with forms are available below to download. Submissions and enquiries to iemtaspring2017@gmail.com please. Please take a moment to pass on this email/documents to anyone you may feel would be interested in attending or presenting. 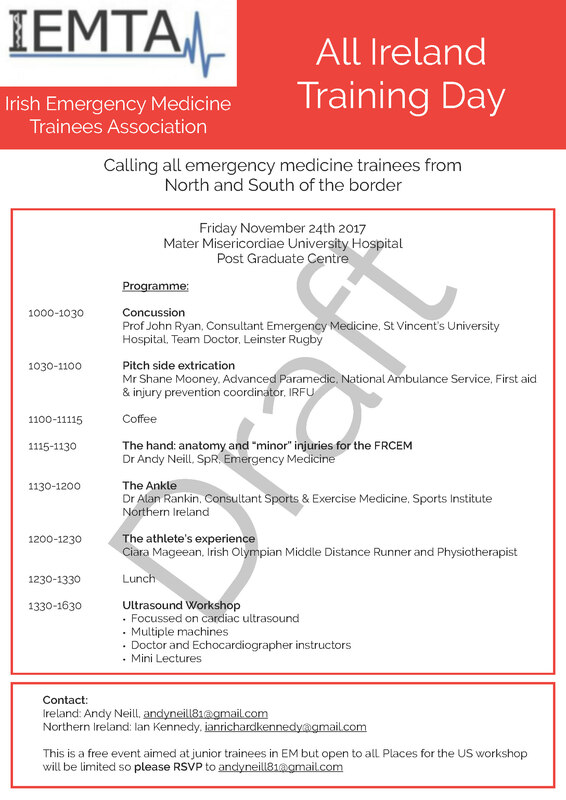 The SVUH Emergency Department hosts an introductory course in Emergency Medicine twice yearly and the 32nd course is taking place on Friday 1 and Saturday 2 July 2016. It’s an excellent course and our previous attendees found it not only educational but also highly enjoyable. Last Friday saw another fantastic IEMTA Scientific Meeting taking place, this year in the Mater Hospital. Congratulations to Mai Nguyen for all her work organising the night. T he IEMTA Spring Scientific Meeting is taking place in the Post Graduate Centre at the Mater this Friday! Meeting kicks off at 18:30 with speakers starting at 19:00 sharp! With SMACC Dublin and EMS Gathering conferences taking place in June, we’ve decided to keep that theme for our meeting! Check out the programme below. Social drinks will take place at The Back Page located just 500 meters away on Phibsborough Rd.